Miyazaki is overlooked by mountains close to the south and tall bluffs farther inland to the west. A sizable plain stretches out to the north, dotted with small towns and villages and many level roads. The 25th Division has fought tooth and nail to claim the first peaks of the mountains in the south. After taking the near slopes, with ample Navy gun support, they are stumped by defenses on the reverse slopes, supported by more Japanese forces on the next hills. On Kyushu there is always one more hill, and somehow it’s always a little higher than the one we just took. Rain has frustrated efforts to hit the back sides of ridge lines from the air and to observe enemy movements. Overnight Japanese infantry and a stunningly large tank formation advanced on the 33rd Division, which was in a semicircle west and north of Miyazaki. They engaged while it was still dark, after a large artillery barrage. The barrage was not a random pattern, it was directed against particular parts of the division camp. Forward supply points were a sore loss, and medical tents were not spared. At the sound of tank engines flares shot into the sky and a giant carnival shooting gallery opened up. The main road from Miyakonojo, and several parallel to it, ran directly into the 136th Infantry Regiment. 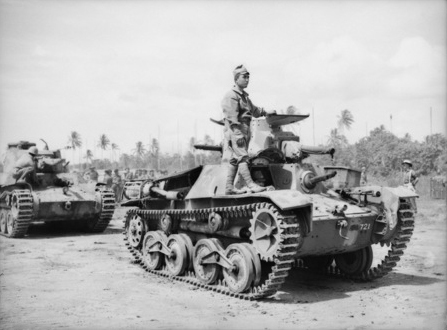 Division armor was not positioned forward, so the ground pounders fought with small towed guns and bazookas against the tank columns and their infantry support. While many tanks were flaming hulks lighting the night, others got right into the American lines, spewing machine gun rounds up and down the line. At first light a short American retreat was organized. Ammo was in desperate supply, especially anti tank rockets. While it was still dark an estimated two thousand Japanese infantry emerged practically out of the dirt directly in front of the 130th Infantry, right of the 136th. Fighting too close for artillery or even mortar support, the forces fought with field guns, rifles, knives, and rocks through the morning. Both forces bled heavily. In the end, reserves were engaged, more ammo was delivered, and American lines are back where they were yesterday. Dozens of Japanese tanks are a field of charred scrap. The attacking Japanese infantry retreated at mid-day, leaving more than a thousand bodies behind. But the American 25th and 33rd divisions are inoperative, having pushed the medical chain to its limit and beyond. And they are no closer to the heavy guns hidden inland which keep them up at night and much worse.